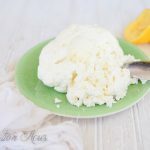 It’s so easy to learn how to make a cottage cheese recipe at home that is fresh, creamy, sweet, and tastes absolutely delicious! Last year I decided it was high time I learned how to make cottage cheese. I had no idea what I was in for when I formed that resolution. I figured, “Eh. It’s kinda like ricotta cheese. How hard can it be?” It wasn’t difficult so much as it was… disgusting. Turns out that homemade cottage cheese is nothing like the store bought that is familiar to our palattes. 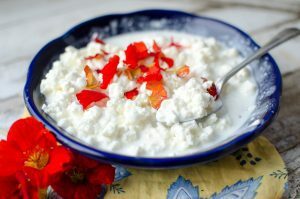 I tried many cottage cheese recipes and batch after batch, new recipe after new recipe. Sure they might be traditional or cultured or easy, whatever the selling feature is on the recipe. But they all tasted like sour milk. Even my cheese-loving Lydia was spitting them out and apprehensive to try the next batch. I ended up buying a couple cartons of cottage cheese from the store to really pinpoint the flavors and texture and in the end I finally nailed down a recipe that is pretty darn close and pretty darn delicious. And it looks more like cottage cheese instead of large curd ricotta with some cream stirred in. 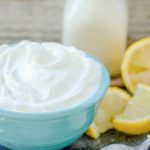 This cottage cheese recipe is fresh, creamy, sweet, and good enough you’ll want to eat it by the spoonful! Warm the milk to about 80 degrees. Stir in the rennet and allow the milk to rest for 2 hours. Use a whisk to stir the milk and cut the curds. Let the curds rest for 10 minutes. Slowly warm the cheese to about 100-110 degrees, until you can gently squeeze a curd without it splitting open. Don't go too long or the curds will get hard and rubbery. Strain the cheese through a cheesecloth lined colander and hang it for about 20-30 minutes. Transfer the cheese to a bowl and stir in the salt, cream, and sour cream adding more if necessary to achieve the desired taste and consistency. Yum! I'm going to try with goat milk. 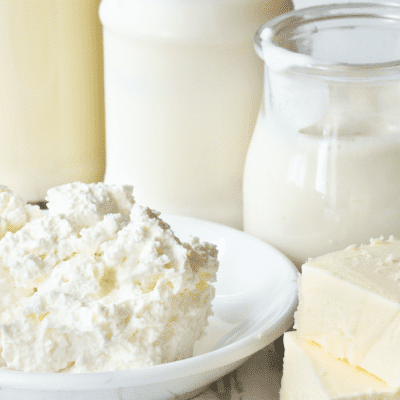 Years ago, cottage cheese from the grocery store did not have anything in it but milk and rennet and salt. No slimy stuff like carageenan that they put in today. I cannot wait to try you receipe. I quit buying the store stuff about 30 years ago. When I was a little girl my grandmother made her own and it was wonderful. Will this recipe work with lactose free milk and sour cream? I’m not sure, I haven’t tried it. If it’s ultra high temp pasteurized, definitely not. 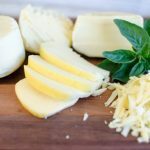 If I have lactose-free milk that is not UP, can I make cheese? With a lactose-free milk, that is not ultra-pasteurized, you will be able to make our 30 Minute Mozzarella and Ricotta. However, you will not be able to make other cheeses. The process of cheese making is based on the bacterial cultures converting the lactose in milk to lactic acid. 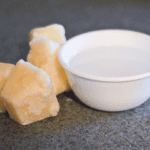 This process drives the conversion of liquid milk to curds, which eventually becomes cheese. This conversion also causes the moisture (whey) to be released. Without lactose in milk there is no food to support the bacterial cultures. How much lactose is there in cheese? The good news for the lactose-intolerant is that there is much less lactose in cheese than in milk. A cup of cow’s milk contains about 10-12 grams of lactose. An ounce of Swiss or Cheddar cheese contains less than one gram of lactose. Most of the lactose found in cheese is removed with the whey during the cheese making process. The rest is consumed by the culture in the first few weeks of aging. Looks tasty! What is the approximate yield of this recipe? Thanks! You know, I can’t recall (it’s been a while since I made it. I suppose it would vary depending on the components in the milk. Someone in the comments above suggested making a video- I made a note to get you a yield when I do. That’s a good question! With ricotta and cottage cheese I only give it a gentle occasional stir just to distribute heat a little more evenly. (Or prevent scorching in the case of ricotta which gets much warmer.) My understanding is that to frequent or vigorous stirring will make for smaller curds. I live in Costa Rica. Many items are not available here, or are called something else. Do you know what I can substitute for Rennet?